It was 1996, and for months, Tinker, the world’s greatest sneaker designer, had been working on a new shoe for the greatest basketball player in the world. But Tinker wasn’t getting anywhere. Then, while watching the Chicago Bulls on television, Tinker saw Michael Jordan through a different lens. On the court, the chiseled 6-foot-6 shooting guard was smart and sinewy. He was powerful and instinctive. He could conserve his energy like no other. At the right time and moment, he’d attack. Jordan displayed predatory behavior, reminding Tinker of a feline — specifically, a black cat. He sketched his vision on trace paper. Then he boarded a plane. Jordan was at The Forum in Inglewood, California, on the set of what would become the iconic “Frozen Moment” commercial. Between takes, secluded behind a prop while seated in director’s chairs, Tinker unveiled a presentation board to Jordan. 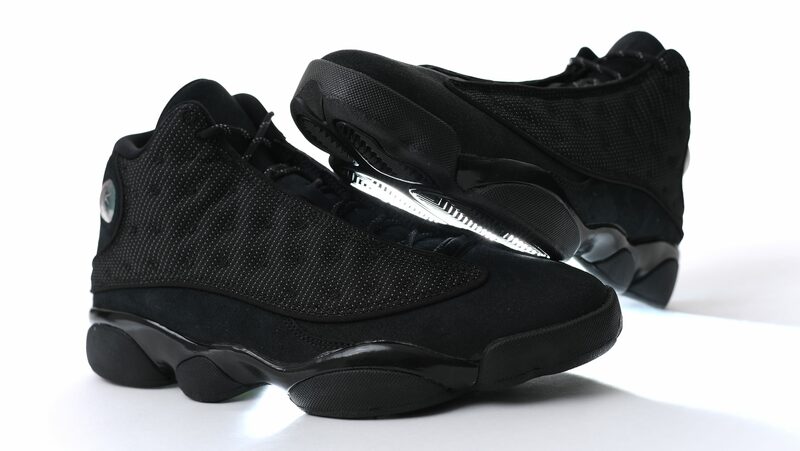 It featured the side and bottom views of his design for the Air Jordan XIII. Flanking the shoe were illustrations of two black cats with glowing eyes. A year later, in 1997, after countless changes to the shoe’s look and a then-revolutionary design process geared toward maintaining Jordan’s high level of on-court performance, the Air Jordan XIII was released. The sneaker celebrates its 20th anniversary this year, and on Jan. 21, for the first time, Nike released the Air Jordan XIII “Black Cat” — the first time in this colorway, and a tribute to the journey that began two decades ago, when Tinker channeled an alter-ego of Jordan few people could put their finger on. The original presentation board featuring the Air Jordan XIII ‘Black Cat’ concept that designer Tinker Hatfield showed Michael Jordan in 1996. There are 127 sketches of the Air Jordan XIII — at least those that have seen the light of day. For every shoe he designed for Jordan — his first was the Air Jordan III, released in 1988 — Tinker completed between 100 and 200 sketches, all of which he signed and dated. The first sketch of the XIII is dated Sept. 11, 1995. It only includes two small drawings of the sneaker, as most of the space on the page is taken up by Tinker’s extensive notes. Trained in architecture at the University of Oregon, and originally hired at Nike in 1981 to design offices, apparel showrooms and retail outlets, Tinker penned thoughts on everything from the “rigid plate technology for quick response and support” he envisioned for the shoe to the “Warner Bros. Movie” (the then-unreleased Space Jam) to Jordan’s return to the NBA in 1995 after retiring for nearly two full seasons, to what the return meant for Jordan’s place in both the world of basketball and world of sneakers. “B-ball needs a classy spokesperson wearing a classy shoe instead of a crazy shoe,” wrote Tinker, who began his product design career at Nike in 1985. Once he developed the “Black Cat” concept, Tinker employed it throughout the entire structure of the design, while taking into account the point at which Jordan was in his career and the elements he needed in a shoe to reinforce his reign. Out of retirement, Jordan won back-to-back championships in ’96 and ’97, and was hungry for the second three-peat of his career. His adversaries were hungry for a changing of the guard, so they defended him harder than ever before. Jordan took beatings every night, but preserving his speed and physicality was crucial on his run to another championship. Jordan needed more comfort, flexibility, contact with the floor, and traction from his shoes. The XIII’s outsole, which mimics the paws of a cat and is still a part of the 2017 design, delivered just that. For much of the design and sketching process, Tinker also visualized a mid-foot strap for Jordan to make quick microadjustments to the tightness of the shoe. But the strap never materialized past the prototype. “As Michael tried on the shoe, laced it up and went out to play around a little bit, he said, ‘It doesn’t need a strap. Let’s not put anything on it that it doesn’t need.’ I agreed with him … and so, we dropped it,” said Tinker. Sept. 11, 1995 — designer Tinker Hatfield’s first sketch of the Air Jordan XIII. As hard as this might be for sneakerheads to fathom, the strap isn’t the oddest secret surrounding the shoe. Following the meeting with Jordan in California, Tinker returned to Portland, where he began struggling to fine-tune the catlike details of the design while using only markers and colored pencils. Going through layer after layer of tracing paper became tedious, so Tinker recruited Mark Smith from Nike’s graphics department to help. Late into the night, Tinker and Smith, who designed T-shirts for Nike, went over revision after revision. The two added flowing lines and vibrant color. Together they enhanced the shoe’s piercing green holographic eye, a recreation of a cat’s gaze, and the reflective mesh side panels, which represent the flecks of color in the fur of a black panther or leopard. The Air Jordan XIII came to life while Tinker stood over Smith’s shoulder as he sat in front of a screen. For the first time at Nike, a shoe was designed using a computer. On Sept. 9, 1997, Nike made what is still to this day one of its biggest announcements. The company gave Jordan his own brand, marking the “first time a team sports player turned himself into a brand on such a sweeping scale,” according to a USA Today cover story. The Jordan Brand was launched as a subset to Nike, estimated at the time to generate more than $225 million a year in sales from his signature line of sneakers as well as a new line of sportswear. It featured the side and bottom views of his design for the Air Jordan XIII. Flanking the shoe were illustrations of two black cats with glowing eyes. By the time of the ’98 playoffs, Tinker had already turned around the Air Jordan XIV, which Jordan wore in the NBA Finals against the Utah Jazz in rotation with the XIII. Only one shoe, however, is remembered from that Finals series. Designer Tinker Hatfield’s original sketches of the Air Jordan XIII. Courtesy of Jordan Brand. The Air Jordan XIII doesn’t have a signature on-court moment — not like Jordan’s “Flu Game” in the XIIs, or his “Last Shot” in the XIVs, or even his free-throw line dunk in the IIIs. In Tinker’s eyes, the shoe doesn’t need one. The XIIIs still made history. The Black Cat design — eternal.